I’ve mentioned in the blog before the idea of different foot strikes when you are running be they forefoot, midfoot or rear foot. A rear foot or heel strike tends to get a bad press, especially when the idea of running barefoot was at it’s peak yet there is nothing wrong with running with a heel strike vs mid or forefoot and most of us will tend towards a heal strike until we are running at a sufficiently high pace. You will also tend to see even faster runners or those who tend towards a mid/forefoot strike moving towards a heel strike as they tire, most noticeable during longer races such as marathons or the running portion of an IronMan. Having said that the heel strike is ok it does come with a major caveat which is that the foot must land close to or under the body as opposed to in front of the body. The form of heel strike we see most people employing, and the one that gives it a bad press, is where the foot lands in front of them which creates a braking force to your forwards momentum and really doesn’t distribute the forces well through the body’s structures in a way that they developed to absorb. 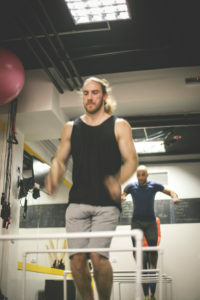 Moving to a more body friendly version requires a little bit of work retraining how you run to bring the foot closer to the body’s centre of mass. In order to bring the landing position of the foot under the body we need to increase the cadence that we run at, more strides per minute, and one way to achieve this is to shorten the stride a bit. To achieve this we want to employ a few drills that will work on the different aspects involved in running such as arm swing, foot contact time and how we lift the foot. Arm swing; When we are using the arms regardless of the speed there should be an active movement. This will be more pronounced the faster we go or if running uphill but even at an easy pace there should still be an conscious, eventually subconscious, pushing of the elbows backwards. The arms should also be kept at the sides of the body with minimal cross body movement. Contact time; Ground contact time should be kept to a minimum and you almost want to think as though you are running on hot coals as you look to actively pull your foot off the ground as fast as possible after making contact. Foot lift; with the foot lift we ant to move away from pulling the foot up and forward, swing the leg straight though with minimal knee bend, to aiming to pull the heel up off the ground with the hamstrings. The result of this will be to keep the foot under the hip as you lift it off the ground. The best time to work on these ideas is during the warm up spending a bit of time on each one before getting to the work portion of the run. 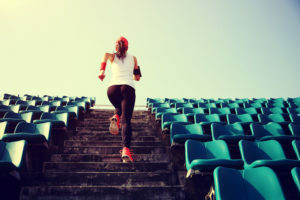 When you are into the workout portion of the run try not to worry about the movements too much just visiting them for a check in rather than concentrating on them. 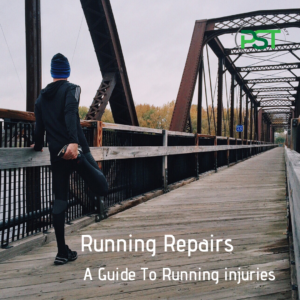 The benefits of this is that we don’t force the changes to how you run which may result in over use injuries as we stress the tissues beyond their ability to adapt. Over time and using the drills at the start of each session your form will change to a more body friendly style.